Just a few days after celebrating the opening of the first Sandro store in Los Angeles, the 23-year-old actress, model, and singer attended the PaleyFest panel on Friday evening. Emma Roberts was joined at the event by her ‘American Horror Story’ co-stars Angela Bassett, Denis O’Hare, Evan Peters, Frances Conroy, Gabourey Sidibe, Jamie Brewer, and Sarah Paulson. She donned a chiffon layered dress from Finders Keepers and accessorized with jewelry by Meira T and Harry Kotlar. To complete the outfit, she wore a stunning pair of pointy-toe jewel “Tia” pumps by Jimmy Choo. How do you like Emma’s retro-glam look? 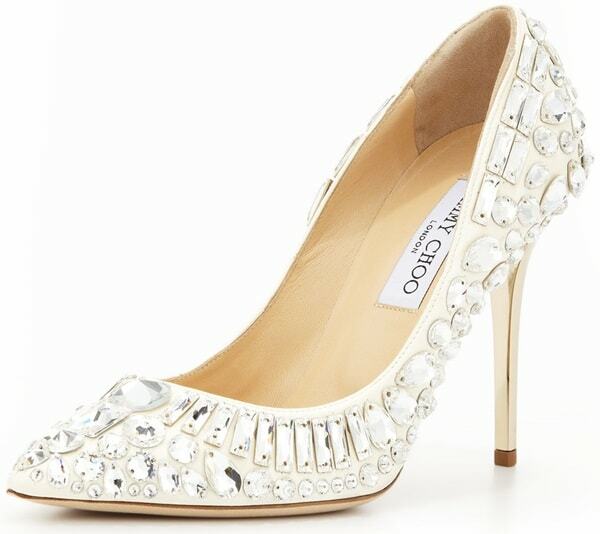 Her sparkling ‘Tia’ pumps from Jimmy Choo feature mixed-facet crystals and low-cut vamps that elongate the legs. You can also buy them with a lower heel at Neiman Marcus.